How can God change the life of a prostitute? We live difficult times of moral decline, when a great number of women and girls became prostitutes. Once, I and my friend, Ion Cheptene, were back from Egypt, after we together with our teachers, Mia and Costel Oglice had had an inductive Bible study conference for the church ministers from that country. When we got on the airplane, that flew from Lamaka (Cyprus) to Chisinau, we noticed that almost all passengers were prostitutes that were coming home for a while. How did we find out? They themselves kept looking at us, and then they came closer and tried to make the arrangements to offer their “services” when we landed. There was a fool man by my side who made the arrangements with one of them to use her “services” when we landed. All those things were so disgusting, but we thought that God wanted us to be in the same plane with those women to tell them about the salvation they could have, if they believed in the Lord Jesus. When we started talking to them, all other women approached us and some of them were crying when we were telling them about God’s perspective for their lives and how He could repair their lives, the same way he had done with Rahab. Here is why Rahab became a prostitute. Immorality was accepted as a normal thing in the context she lived. How has the immorality of the world we live in affected you? Maybe you are a victim of immorality, as Rahab became? Rahab assumed a very great risk when she chose to profit by the possibility of salvation for her and for her household. Do you want to benefit by the possibility of salvation from the sin slavery you are in, by faith in our Lord Jesus Christ? 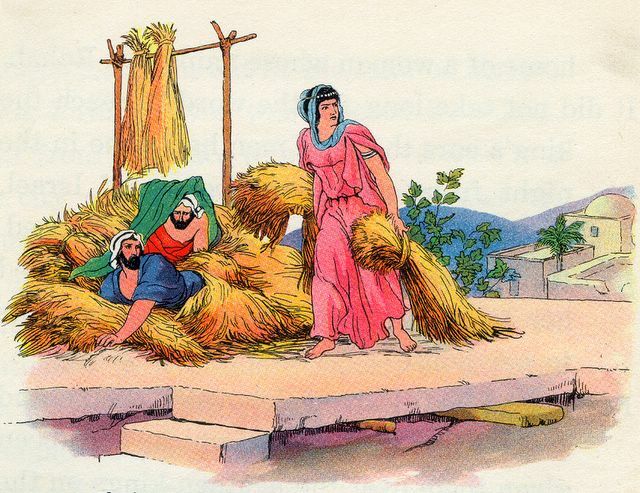 Rahab saved her own life and the lives of her relatives by faith and courage. Now, they, her relatives were “outside the camp”, that means they received the freedom to go wherever they wanted, but Rahab was accepted to live with the people of God and the action of her faith was honored very much in the midst of Israel. Salmon married Rahab, and he did not mean that she had been a prostitute once. He didn’t look at Rahab’s immoral past, but he set much store on her faith and devotion to God. God gave them at least one child, Boaz, who was a righteous man and had a very beautiful character. You can read more about the actions of his faith in the book of Ruth. The action of Rahab’s faith was so great, that it has not only shadowed her past, but she was honored by God to be a part of the genealogy of the Lord Jesus Christ. Maybe you live an immoral life now, maybe you are a prostitute, or maybe you do not sell yourself for money, but you live today with one, tomorrow with another one. Or, maybe even worse, you live with someone in adultery, and you console yourself that this is not bad, because “everyone around is doing this”. Or maybe you are a lesbian, or a homosexual. Don’t deceive yourself. God is the same yesterday, today and forever. He doesn’t change and He doesn’t change His moral standards either, that He let for us, people, the creation of His hands. Turn to God with all your heart. He will forgive you, He will set you free from the slavery of the immorality you live in and He will make you a new living. He will give you a future and a hope. He can build up a family that will bring you joy and fulfillment. Go to God with all your heart by faith in the Lord Jesus Christ. Follow Rahab’s example.